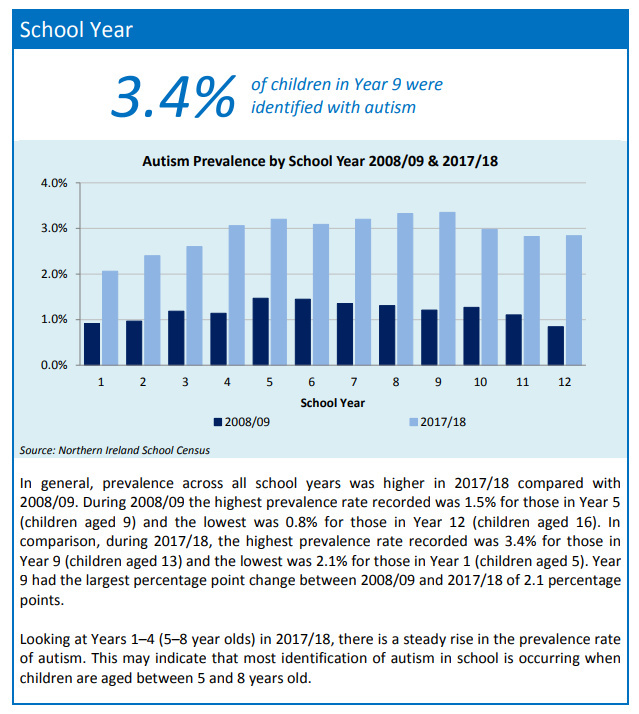 Consider this post discussing the publication: "The Prevalence of Autism (including Aspergers Syndrome) in School age Children in Northern Ireland 2018" an extension of other musings on previous figures to come out of Northern Ireland (see here). The report(s) are open-access for anyone to see, but I'm going to pick out a few choice snippets of information. 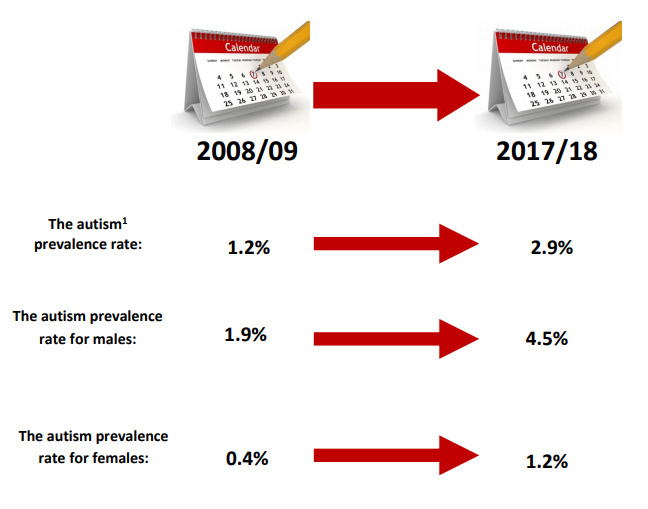 So: the last blogging time I talked about the Northern Ireland (NI) report, I mentioned that the [estimated] prevalence rate for boys was approaching 4% based on those 2015/2016 figures. 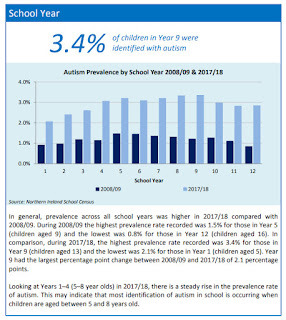 Well, that's been well and truly surpassed and is now heading towards 5% of boys in NI "identified with autism." How are they identified I hear you ask? Well, school data is the answer, "from the ‘Northern Ireland School Census’" where schools are legally obliged by the Department of Education in NI to provide information about registered pupils. Further: "The data only captures those children identified with autism, at any time there may be additional children who may be progressing through the full assessment process and it is possible that a number of children may be identified as having autism at a later date." That last point is important in the context that NI has a bit of a history of 'long-waiting lists' for autism assessments (see here). Oh, I should also mention that the National Health Service (NHS) functions in Northern Ireland just as it does in other parts of the United Kingdom (UK) meaning that healthcare (including autism assessment and diagnosis) is free at the point of need. This does not mean that things are going to be 'fast or rapid' temporally, but does mean that people don't have to typically pay extra for such clinical services. Also: autism prevalence by school year shows some interesting patterns. Take a look at the screen grab I've added observing that 3.4% of children in Year 9 were "identified with autism." Just in case you're not up to speed with what Year 9 translates as in age terms, have a look at this link which covers England. I think things are slightly different in NI (see here) but generally speaking, Year 9 covers somewhere between 12-14 years of age. Finally, something else potentially quite important: "The Northern Ireland urban population has a statistically significant higher prevalence rate than the rural population." Note those words 'statistically significant', inferring that chance alone, is probably not the driver of such disparity. It's been a while since I've blogged about 'urban vs. rural' in the context of autism (see here) and I'm sure there are 101 different explanations for the mismatch. Combined however with some other observations on a possible influence of deprivation and poverty on the recent figures ("In 2017/18, the rate of autism in the most deprived MDM [Multiple Deprivation Measure] decile was 31% higher than the Northern Ireland average") one could argue that any explanation is going to be multi-factorial. 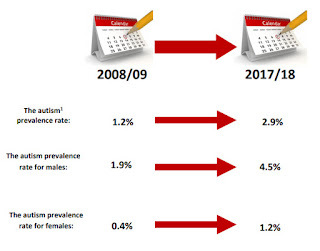 I look at these most recent figures and cannot help but think that 'increased awareness' and/or other 'artificial' explanations are (yet again) unable to entirely account for the sorts of increase in diagnosed autism being noted (see here). Were schools and other professionals 'so bad at recognising and/or recording autism' just a few years ago? No, they weren't. And to infer they were is bit a slur on the professionalism of many teachers and other associated professionals, many of whom have seen literally generations of schoolchildren pass through their educational doors. There's also another important question to attend to on the basis of the recent figures: are the resources currently and in the future, in place to cope with the rising demands on things like education, health and social care following the increase in the numbers of children being diagnosed with autism? I say this in the context that if there are already insufficient resources to cope with the numbers requiring assessment for autism (assessments that are typically not inexpensive ), how can we hope that there will be sufficient resources in place over a lifetime of potential need? Galliver M. et al. Cost of assessing a child for possible autism spectrum disorder? An observational study of current practice in child development centres in the UK. BMJ Paediatr Open. 2017 Nov 30;1(1):e000052.